I had thought that once children progressed from high chairs and spoon-feeding to feeding themselves, it would feel a little bit less like feeding time at the zoo. But alas, as they grow, so do appetites and opinions. It is still feeding time – the animals have just got bigger and noisier. I am thinking it is politically incorrect to refer to my children as animals, but I call Holdie b’Goldie my baby so I figure the terms of endearment go both ways. 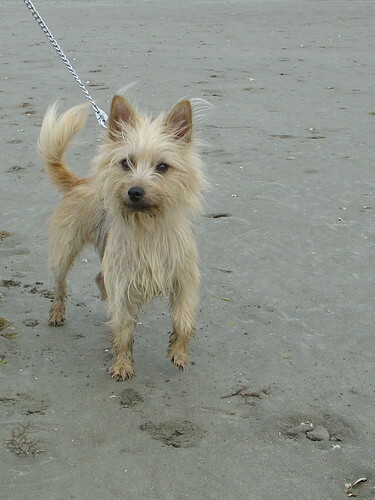 Holden is actually my son’s sweet little Aussie Terrier – his “real” name is frequently extended to the more affectionate (and twee) Holdie b’Goldie borrowing from Hairy Maclary’s fame. Holdie and Hairy could be brothers. 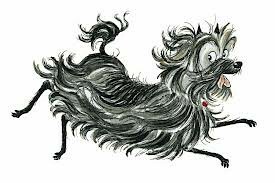 Hairy Maclary is a very famous children’s story book character dreamed up by Lynley Dodd. His capers with his mates are some of the best bed time reading for littlies. But back to the food – I first became aware of a wonderfully creative cook when we had two wee children and a single income from a newly formed business – so not much cash to splash at the supermarket. The idea of cooking flash but making it all myself was quite exciting back then – tortilla – yep we made them. Jam, relish, pickles…… I tried all sorts of things to make our diet interesting. But I was only in my twenties and still had my learners licence in cooking. That is about when the Destitute Gourmet, Sophie Gray, entered our life. I was so enthusiastic by her cookbook that I bought a copy for my sister-in-law. I am not sure how much her copy was used but ours is well-marked with splatters of this and that. Stunning Food from Small Change, first published in 2000 has been followed by five or six more cookbooks, most of which I have “had” to add to my collection. Sophie also has a website, blog and monthly features in two of New Zealand’s food magazines: Taste and Food. Spring forward twelve years and in an economic climate which has caused the majority to shave a little spending from here and there, Sophie’s new book “Feed the family for $15 or less” goes a long way to stretch the grocery dollars. And a tight food budget doesn’t mean smoked salmon isn’t on the menu, just that 100g can be padded out with peas and pasta to feed 4-6. Sophie is big on menu planning and for years we followed her advice and planned our menus a week or two in advance. I was a little extreme in following my set menu’s and if unexpected guests or a turn of events caused a deviation from my list I would unravel quite quickly. Time and experience has been a great teacher and our system has relaxed to a much more manageable state. I have to work at that though, as I flick though a new cookbook or magazine, my fingers itch to get a menu plan going to make all these delicious recipes, and then my feet itch to get to the supermarket to buy all those fabulous ingredients required, and I get anxious as I only have so many more meals in my life to make and there are so many recipes I want to try….. But to feed my family on $15 or less means I could spend those save dollars on a couple more cookbooks, or maybe another antique apple tree or two. Hmm, perhaps we need to save a few pennies to buy some more land so we can plant some more trees to grow more apples to save more dollars to buy more cookbooks. 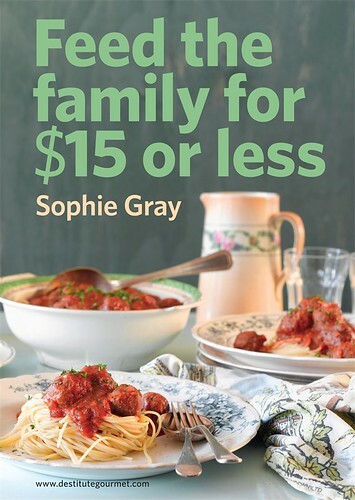 But back to feeding my family for $15 – one of the best parts about Sophie’s cookbooks is that the food takes you on a journey from New Zealand across to India, and over to Thailand with a short stop in France then on to a longer stay in Italy before hopping over to China. My new habit when checking out a cookbook is to start with the index. Beginning right at A – we have apple cider gravy. And that is the only recipe I can find with a specific mention of apples at a quick glance. As old habits are hard to murder, the next stop is the desserts & baking chapters. I will often decide whether a book is worth adding to my collecting simply by the dessert offerings. If there is a crème brulee, the book is pretty much sold. And yet, I’ve never made one despite having a brulee torch and heaps of recipe books with crème brulee recipes in them. This particular book doesn’t have a baking nor dessert section, but it does have breakfast, scrolls and rolls. Not quite the same but it does the trick. My sister-in-law (the other one without the book) often will finish the evening meal with a pudding as another way of stretching the food budget further. A quick and simple fruit or milky pudding just like my grandma used to make – the Edmonds book is perfect for these. Pancakes, waffles, muesli begin the day with a good healthy start. If savoury is more your thing the monte cristo sandwiches with melted cheese, ham and egg take me back to my university days. Make your own Chelsea Buns – 12 for less than $4 and much much tastier than store-bought. I don’t make Chelsea Buns very often, and when I do, I always think I won’t leave it so long before I make the next batch. I guess it is something to do with the fact they are treat buns not everyday buns, but that line of thought wouldn’t stop me making a chocolate cake every day. In my mind the Italians are very good at making a few humble ingredients fill many bellies with satisfyingly tasty food. If my daughter didn’t look and act so much like me, I’d think she was swapped at birth with a wee Italian bambino. If it’s pasta or pizza, she’ll eat it. As a toddler, olives and cheese were introduced and accepted into her diet with gusto. If it’s risotto, she’ll even make it for us. I have placed the book strategically on the bench, opened to page 73: Lasagne with Herby Tomato Sauce. Plan is – I return home from my day job tomorrow to a house bursting with the aroma of almost ready dinner prepared by my thoughtful teenaged daughter. Yeah right! This entry was posted in Book Review and tagged cookbook review, cooking on a budget, Sophie Gray by Jo Dohrman. Bookmark the permalink.